12/1 – Burke County GOP Potluck dinner at GOP Headquarters on Hwy-18 across from Harris Teeter. 12/1 – C-Power (Wilkes TEA Party) meeting in Wilkesboro cpower.us. Brushy Mountain Smokehouse and Creamery, 201 Wilkesboro Boulevard, N. Wilkesboro (336) 667-9464. 12/3 – Caldwell County Republican PARTY Christmas dinner $25 per ticket ($20 per ticket if you bring a toy) at the Cedar Rock Country Club. Link. Website says to call for information. 12/6 – Caldwell TEA Party regular meeting, TUESDAY, 7pm at the Caldwell County Library, 120 Hospital Ave., Lenoir, NC 28645. Our guests will be two US Congressional candidates Mark Meadows and Ed Krause. Please come meet these gentlemen, bring a friend, learn about their platform, shake their hand and ask them a question or two. Ed Krause is an attorney and author from McDowell County who has run for office in the past. Mark Meadows is a business owner from Jackson County, serves on many boards in WNC, but has never run for public office. Ed Krause (R) doesn’t have a website that I can find. Article. Mark Meadows (R) official website – http://www.meadowsforcongress.com and announcement here http://madisonncgop.com/press-releases/. 12/9 – Charlotte Mecklenburg Republican Women host their annual Christmas luncheon with guest Brigitte Gabriel from Act for America. Event details – http://www.cmrw.org/ 11:00 am-1:30 pm. 12/15 – Caldwell TEA Party regular meeting. Movie night — Invasion: Freedom under Fire! Mark Hager from Yadkin Valley TEA Party will come share this documentary with us Thursday night. His organization and TEA Party Patriots produced it about the lives of Americans living along the border with Mexico. They filmed with the help Sheriff Larry Dever and Sheriff Paul Babeau. The AZ project documentary link, link. Please join us for this informative evening. 7pm at the Caldwell County Library, 120 Hospital Ave., Lenoir, NC 28645. 11/1 – NC Speaker Thom Tillis will be hosting a Townhall meeting at 5pm at CVCC. 11/1 – Caldwell County Republican Party executive meeting with Congressional candidate Chris Petrella. 11/1 – Caldwell TEA Party meeting CANCELLED. Sorry folks, this meeting had to be sacrificed because everyone has been so busy, we just couldn’t organize a meeting. My sincerest apologies. 11/3 – C-POWER meeting in Wilkesboro cpower.us. Brushy Mountain Smokehouse and Creamery, 201 Wilkesboro Boulevard, N. Wilkesboro (336) 667-9464. — I heard this was a great meeting from several people. 11/3 – Burke County GOP Meeting at Granny’s Kitchen in Ichard with special guest Vance Patterson, Congressional candidate. 11/3 – Catawba County Men’s Club will host Dan Forest. 11/8 – Election Day for Municipal races. 11/11 – 11th District Golden Elephant dinner 6pm in Fletcher. 11/12 – NCFRW Conference in Concord. 11/17 – Caldwell TEA Party meeting with guest Dr. Dan Eichenbaum, candidate for US House 11th District (our new district January 2013). Dr. Dan ran for Congress in 2010 and narrowly lost the Primary Election in the 11th District. His campaign website. 7pm at the Caldwell County Library, 120 Hospital Ave., Lenoir, NC 28645. 11/21 – Alexander County Women’s Club has invited Christine Gates to speak at their meeting about activities of the TEA Party in North Carolina. Meeting at Alexander County GOP HQ on Hwy-90 next to the county court house at 6:30pm. 11/26-27 – Hickory Gun and Knife Show. LINK Got ammo? 11/28 – Caldwell County Republican Party (GOP) Men’s and Women’s Club meeting night. Mark Meadows and Vance Patterson candidates for US Congress. Women’s meeting at Mayflower Restaurant in Lenoir on Hwy 321 at 7pm (6pm for dinner). Elections for women’s club officers will happen at this meeting – all members are urged to attend. Men’s meeting at AJ’s Steakhouse in Lenoir on Hwy 321 at 7pm (6pm for dinner). 10/2 – Caldwell TEA Party meeting cancelled. 10/6 Burke County GOP meeting with special guest Mark Meadows. 6pm dinner at Granny’s Kitchen in Ichard just off exit 116 on I-40. 7pm meeting. This is one of the friendliest meetings you’ll ever attend! 10/11 – Caldwell County GOP executive meeting with special guest Ed Krouse, US Congressional candidate. 7pm at the Library. 10/20 – Caldwell TEA Party meeting, 7pm at the library. Our guest will be Spence Campbell candidate for US House in the 11th District (our new district). I would also like to have all the municipal race candidates come back and see us again. 10/27 – Candidate introduction of Mark Meadows, 7pm at the library. Hosted by the Caldwell County Republican Party, but open to everyone for the purpose of a Meet and Greet for US Congressional candidate. This will be an informal gathering and a great opportunity to meet another candidate. Bring a friend to meet this candidate. Come on get involved. What are you waiting for?!! Mark Meadows’ website. 10/28-29 – INSTITUTE ON THE CONSTITUTION 2-day study / lecture group. Friday 8am -5pm, and Saturday 9am-5pm. To register call 336-846-3346 or email ffhm@skybest.com. Location is Faith Fellowship & Harvest Ministries, 676 S. Main Street, Jefferson, NC 28640. Constitutional attorney and professor, Dr. John Eidsmoe of Faulker University. Each lecture is 50 minutes. 9/1 – Burke County GOP meeting. Granny’s Kitchen in Ichard. 6pm for dinner and the food is GREAT!! 7pm for the meeting. Jeff Hunt, candidate for US House, 11th District, introduced himself to the Party. 9/8 – Caldwell TEA Party Meeting, 7pm, at the library. In light of the shocking announcement of federal law suits against dozens of American banks on Friday by the Obama Administration and the threat of seizing control of many for their roles in the mortgage meltdown. When in reality, it was the Dodd-Frank bill that forced banks to make a percentage of mortgage loans to sub-prime borrowers (many of which had no means of repaying the loans). So, if anyone should be investigated, it should be Dodd, Frank, Freddie Mac, and Fannie Mae. I’m working on getting a speaker from the banking industry to brief us on current banking regulation (or over-regulation) and how it will effect us all in the future. As soon as I have a confirmed speaker, I will share the name here. Please join us. 9/12 – Caldwell County Board of Commission meeting 5:30pm downstairs in the county building. 9/13 Caldwell County GOP meeting, 7pm at the library. 9/17 – NC 5th District TEA Party Convention http://www.nc5thdistrictteaparty.com 10am -4pm at Wilkes Community College. Event is free, but you need tickets. 9/27-10/1 – Caldwell County Fair. http://www.caldwellcountyfairgrounds.com/ Caldwell TEA Party will have a booth there and I need a Friday night volunteer to pass out Voter Guides. 9/29 – Caldwell TEA Party meeting. We will have our next Caldwell TEA Party meeting on Thursday, 9/29, at 6:45pm at the Library. Candidate for US House in our new 11th District, Mark Meadows, will be stopping by at the beginning of the meeting to meet everyone and shake a few hands. He will leave as soon as the meeting gets started, so if you’d like to meet him arrive early. This will be a housekeeping meeting and some videos from this weekend’s TEA Party Convention in Wilkesboro. County Fair booth volunteers for Friday night needed. We will have Voter Guides to pass out at the fair. Housekeeping: 1) set a new meeting day of the week, 2) pass out completed presidential voter guides, and 3) add US House race candidate list. 8/1 – Caldwell County Board of Commission meeting 4:00pm downstairs in the county building. 8/20 – Caldwell Republican Club hosts Hal Weatherman, former Chief of Staff for Rep. Sue Myrick and former Director of Communications for Brigitte Gabriel’s group, Act 4 America. He will come speak about radical Islam in his comprehensive presentation called “Connect the Dots: Information Warfare 101.” Weatherman is a well respected expert in the threat of Islamists and in great demand around the country. This important presentation is being made into a DVD for Act 4 America, and has been given to some of governments’ highest level officials today. Have you ever wondered what motivated Major Hasan who killed 14 and wounded 29 at Fort Hood Army base and why he wasn’t stopped sooner? Have you ever wondered what jihad really means? Do you know the difference between Islam, Islamic, and Islamists? This is presentation on US Law, not religion. This is an open invitation to local law enforcement and elected officials. 7:00 pm at the Caldwell County Public Library, 120 Hospital Avenue, Lenoir, NC 28645. 8/11 – Caldwell TEA Party meeting with guest Dan Forest, candidate for NC Lt. Governor. http://www.danforest.com Bring 2 friends. He has an excellent presentation and will take your questions. We will be done early enough to be home for the 9pm Iowa GOP debate on TV. 8/13 – Moore Tea Citizens “We Ain’t Goin’ Away” picnic on Saturday, August 13th, 12–3pm, Cannon Park, Pinehurst. The founder and head of Tea Party Nation, Judson Phillips, will be keynoting, Cochise County AZ Sheriff Larry Dever will info picnickers about the awful conditions on the AZ border (contrary to what the Obama Administration claims), and we’ll have the writer and producer of “We Ain’t Goin’ Away”, Bruce Bellott, on hand as well. Ben Franklin is stopping by for the picnic, along with many TEA leaders and members from here and across the state. Visit their website www.mooreteacitizens.com. If you can come, just send a note to mooreteacitizens@gmail.com and copy caldwellteaparty@yahoo.com on your email also. We will try to coordinate rides to Pinehurst. Moore TEA Citizens Annual Picnic! 8/13 – Blue Ridge Tea Party Patriots is sponsoring John Guandolo from Washington, DC, to speak on Understanding the (Islam) Threat to America, “The Outlawed Brief”. 9:30am-12:30pm lecture at the Henderson County Library, Hendersonville, NC. Then an RSVP Luncheon and book signing to follow. BRTPP link. 8/15 – Caldwell County Board of Commission meeting 5:30pm downstairs in the county building. 8/16 – Caldwell Republican Club (PAC) candidates invited, 7pm, at the library. http://caldwellrepublicanclub.com/CALENDAR/ Open to everyone. 8/18 Rep. Patrick McHenry’s townhall meeting at the Broyhill Civic Center room 206, 6pm. Last year was a historically large group. Can we double that turnout? Get engaged with your government. Come ask a question. Come listen to his answers. Bring a friend. 8/25 – Caldwell TEA Party meeting 7pm at the library in Lenoir. Vance Patterson, 2010 US House candidate, will be speaking on leadership. Please join us. 7/11 – Caldwell County Board of Commission meeting 5:30pm downstairs in the county building. Budget funding issues will be prominent at this meeting and the July 25th meeting. 7/13 – Caldwell GOP meeting. 7pm at the library. 7/14 – Caldwell TEA Party meeting, 7pm, at the library. Municipal candidates welcome for a Meet and Greet. Short discuss CERT program and possible training for TEA Party members. Looking for donations for AZ / TPP project. Mid-July —– Cochise County Sheriff Dever (video) and Pinal County Sheriff Babeu (video) is teaming up with TEA Party Patriots (TPP) to create a documentary about the REAL situation on the AZ border, that is opposite of the Obama Admin’s very false claims that “the border has never been safer”. TPP participants will be escorted by Sheriff’s Dept Deputies as they interview and film American citizens that live and work near the border. Their story has never been told. The total goal for this project is $6,000. They have raised $4,300, leaving only $1,700 needed to fully fund. Please consider giving to this worthy project. The trip is being planned for mid-July to interview residents and deputies firsthand and to help compile real information about the violence on the border. Caldwell TEA Party has been invited to participate in this project. Caldwell TEA Party will collect donations on behalf of TPP. If you can make a donation, please contact NC State Coordinator for TEA Party Patriots, Mark Hager (336) 909-0344, or by email at tea1773@yadtel.net There will also be a need for technical expertise for the editing of the documentary back at home. Please call if you would like to volunteer to help with portion of the project. HD equipment and an editing room has been donated, but people are still needed for editing the final product. **** ONE OF OUR OWN Caldwell TEA Party expert members will be traveling to AZ to fully participate in the project. 7/25 – Caldwell County Board of Commission meeting 5:30pm downstairs in the county building. Budget funding issues will be prominent at this meeting. 7/28 – Invitation to Meet and Greet in Asheville for Chris Petrella candidate for US House 11th District. The class size for Tactical Handgun II is limited, as we spend focused attention on each student. We will only register 12 participants per class. The cost of the course is $125, and the deposit for the course is $50. 6/3-5 – GOP State Convention. (Most important day is 6/4.) Wilmington, NC. Hilton Willmington Riverside. (301 North Water Street, Wilmington, North Carolina, 28401-3934 Tel: 1-910-763-5900 Fax: 1-910-763-0038) IMPORTANT: You must be at your County Convention in March to be eligible to attend the State Convention. At the County Convention, you pay $1 to be a district delegate (and attend the convention) and -/+ $3 to be a state delegate (and attend the convention). The District Convention doesn’t usually cost anything to attend. The State Convention last year was $375 (?) including hotel and food. When I attended I only paid $70 because I didn’t stay in the hotel there and I only went to one catered, GOP sponsored lunch (most people go out to eat a local restaurant). I will see you all in March, April, and June! 🙂 NC GOP calendar Convention schedule. 6/3-4 Tea Party Patriots, Jenny Beth Martin, will be hosting meetings and a dinner in Wilmington surrounding the events of the NC GOP State Convention. TEA Party Patriots is hosting meetings, dinners and breakfasts in Wilmington during the NC GOP State Convention, June 3-5 (with the 4th being THE most important date). You are all invited to attend these meetings. See below 6/4 date for details on the breakfast. 6/4 – TEA Party Patriots I want to especially highlight the Saturday June 4th breakfast with Cochise County, Arizona, Sheriff Dever. The cost is only $10. Link for details and reservations. 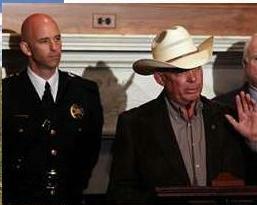 Sheriff Dever is so angry about the last week’s deaths of two deputies in Cochise County. He and Sheriff Babeu from neighboring Pinal County have also been sued by the federal government for enforcing immigration law within their counties. Please come listen to Sheriff Dever’s important message about the dire consequences of illegal immigration coming across our borders. 6/6 – Caldwell County Board of Commission meeting 5:30pm downstairs in the county building. Saturday (tba) 10th District Convention (McHenry’s district). Will cost $5-10. To be held in mid-June after redistricting. Also realize our Congressional district may change. 6/11 – Blues Festival Cedar Rock. 6/15 Caldwell County GOP meeting, 7pm at the library. 6/16 – Regular Meeting, 7pm, room 5. Vote to approve By-Laws. We will be voting on approving the By-Laws. Discussing presidential primary information available here (and in the CANDIDATES tab of the website). Also we to discuss new voter guide survey questions for the Nov. 2011 municipal elections around the county. ….Special meeting on 6/23. GREAT MEETING!!! I think it may have been one of the best ever. We approved the By-Laws. Thank you Sandy Shytle and Judy Steele for all their hard work on the By-Laws. We also put together our first Presidential Voter Guide 2012. It should be posted soon. 6/18 – Tactical I class with Randy Martin. Tactical Handgun I is designed for those who want to gain confidence and comfort with their handgun. In this course, you will learn how to handle your gun with confidence, how to rely on your training during a stressful situation, and how to be better prepared when the need arises. 6/20 – Caldwell County Board of Commission meeting 5:30pm downstairs in the county building. There will be a small reception at 5:00 for the new board appointees; one is our own Shirley Kanode. She has been appointed to the DSS Oversight Board. Congratulations!!!! Please come celebrate with her. 6/20 – Annual Little River VFD budget and election of officers meeting. 6/23 – Caldwell TEA Party special meeting with candidate for NC Lt. Governor Tony Gurley Caldwell Special guest of Caldwell TEA Party. http://tonygurley.com. Mr. Gurley has been a Wake County Commissioner for 10 years and has a very Conservative voting record. He is a Pharmacist in Durham. In a recent phone call with Mr. Gurley, he told me he was inspired by Lt. Governor Rebecca Kleefisch (R-WI) who spoke at the recent NCFRW convention in Hickory that we both attended. Kleefisch is personally working one-on-one with business to recruit businesses to move to Wisconsin. ——- Share this fb event link. Or share this event link. 6/23 – Campaign for Liberty meeting 5:30pm at the library. 6/24 – LiberTEA dinner at my house for Western NC TEA/912 leaders. 6/27 – GOP Men’s and Women’s Club dinner/meeting. Special guest at the Men’s Club meeting is Dan Forest candidate for NC Lt. Governor. Men’s Club meeting at AJ’s Steakhouse in Lenoir on Hwy-321 at 7pm, dinner at 6pm. Women’s Club meeting at Mayflower Restaurant on Hwy-321 in Lenoir at 7pm, dinner at 6pm. 6/28 – Guilford County GOP hosted Hal Weatherman for his presentation of “Connecting the Dots: Radicalism 101.” EXCELLENT PRESENTATION! We will be bringing Mr. Weatherman here to Caldwell county. Possibly on 8/20. 6/28 – Oakhill Community Watch, 7pm at the Ruritan near Oakhill schools. 5/5 – Caldwell TEA Party MEETING, 7pm, at the Library. We are going to watch the South Carolina GOP Presidential Debate together and discuss the candidates’ positions, so we can begin developing a candidate voter guide for the Primary. There is a great need to know the issues and where THEY stand. The class size for Tactical Handgun II is limited, as we spend focused attention on each student. We will only register 12 participants per class. The cost of the course is $125, and the deposit for the course is $50. Only a few spots are remaining. 5/17 – Caldwell County GOP Executive Committee meeting, 7pm at the Caldwell County Library, 120 Hospital Ave., Lenoir, NC 28645. All Republicans are welcome. 5/17 Dr. Stone’s Granite Falls Middle School rally to support schools at 5:30pm hosted by the PTA. ——— I went and this was a very political event. I didn’t know that schools and school personnel could engage in organized anti-party rallies on school property. 5/19 – Caldwell TEA Party regular Meeting. Watching the movie “Agenda”. 4/5 – Caldwell TEA Party elections at regular meeting. 7pm at the MAYFLOWER RESTAURANT, 303 Blowing Rock Blvd, Lenoir. Caldwell TEA Party elections moved to May. Judy, Sandy, Shirley, and Ron have been working on the By-Laws. Let’s vote to adopt or not. What’s your vision for the TEA Party? I need a recommendation for official TEA Party member positions on issues: Debt ceiling, gov’t shutdown, $6.2 Trillion in cuts over 10 years, federal gun control end run, NC easing gun laws, voter ID, “War” in Libya, 2 American executions at the Tijuana, Mexico, border crossing yesterday, Obamacare repeal worth fighting, … I want to put together an official statement and send to public officials at all levels. If you can’t attend the meeting, please shoot me an email with your support or opposition of these issues. I will have information I want to share with you about the newly formed, local, political organization in Caldwell County. We need a new meeting day(s). Tuesday meeting rooms are booked at the library. I suggest Wednesday’s or Friday’s or… Thursday’s. Wilkes TEA Party is showing the movie “Agenda” on 4/7. See our calendar. 4/7 – Wilkes TEA Party (first public meeting) 6:30pm. Movie: “AGENDA: Learn why you should be concerned about the Progressive Agenda.” Location: NW Police Station, 2nd floor. See their website http://www.cpower.us Please support their efforts by seeing the movie and enjoying some refreshments with our patriot neighbors to the north. 4/7 Burke County GOP meeting 7pm (6pm dinner) at Granny’s Kitchen in Ichard (exit 116). 4/9 – Caldwell County Democrat Convention. The location will be in the city/county meeting room at the Caldwell County Office building downstairs. Meeting time will be at 11:00am -1:00pm. 4/12 – Caldwell County GOP Executive Committee meeting, 7pm at the Caldwell County Library, 120 Hospital Ave., Lenoir, NC 28645. All Republicans are welcome. 4/12 Hickory 912 Project Meeting, 7pm, at St. John’s Lutheran Church, 2216 St. John’s Church Road. 4/14 – Young Republicans meeting at the Library, 7pm. 4/16 – Tax Day TEA Party Rally sponsored by Morganton & Caldwell TEA Party groups. Noon until 4pm in Downtown Morganton at the Old Burke Courthouse. Event is for families, is free, and open to the public. RAIN or SHINE!!!! First 100 people get a free t-shirt from FrenzyTs. Food vendors. MUSIC!! Great speakers about Conservative values, smaller government, and lower taxes. John Locke Foundation booth. A host of speakers will be addressing current issues and the presence of America around the world. All are encouraged to bring flags and signs appropriate for the occasion. 4/30 Concealed Carry Permit Course. A concealed carry handgun permit class will be offered with Randy Martin as the instructor. This class will provide the training and certification you need to apply for a concealed carry permit at your local Sheriff’s office. —– C L A S S is FU L L ! 3/1 – Caldwell TEA Party MEETING , Tuesday, 7pm. Is there interest in doing another Social Media class in March? We’ll talk about your experiences at your precinct meetings, if you went. Republican Convention is 3/19. Democrat Convention is 4/9. news about Union busting rallies in Raleigh and other cities. Let’s make some plans for a local TAX DAY TEA PARTY event. I have news about statewide TEA Party activity that is becoming stronger and more organized. Maybe we will bring up the By Laws again, and maybe we will table them indefinitely – think about it. 3/3 – Burke County GOP meeting at 7pm. 6pm for dinner at Granny’s Kitchen in Icard. The food here is excellent – everything!!! 3/8 – Caldwell County GOP meeting. 7pm at the Library. All Republicans are welcome! 3/10 – Young Republicans meeting at the Library, 7pm. Re-scheduled to 3/17. 3/15 – Caldwell TEA Party MEETING, Tuesday, 7pm. Movie “Fire in the Heartland: The awakening of the Conservation woman.” http://www.firefromtheheartland.com/ Women are awakening now because the government is presenting itself as such a danger to our families and our children’s future. The loss of the spirit of the American Dream and individual responsibility is being sold to us as safety. At the Caldwell County Main Library, 120 Hospital Ave, Lenoir, NC 28645. While this movie is playing, I will also have a meeting outside to discuss the upcoming GOP Convention on Saturday, 3/19. I will have Convention Rules and parlimentary procedures for you. If you are a delegate please be there. If you are not a delegate, but would like to go to the District or State Convention, please attend. The Convention is open to ALL REGISTERED REPUBLICANS IN CALDWELL COUNTY. All can attend, only delegates can vote. 3/16 – WNC Commuter Railroad meeting in Valdese at the Townhall at noon. This meeting was postponed another month. There is a big, federal, project underway to build a new commuter railroad line from Salsbury, NC, to Asheville, NC, at an estimated cost for construction of $1 million per mile. There is a public hearing in Valdese. I urge you all to be there, especially if you think this is misuse of taxpayer money!! Call Larry Johnson 828-879-2120 by 3/14 to reserve a lunch, if you want a lunch. From Salisbury to Asheville the train will take 4-hours (10am -2pm) and then it will return at 2:30pm and arrive back in Salisbury at 6:30pm. Nobody is going to do that! I could drive from Salisbury to Asheville in 5-hours and leave at anytime and return at anytime. People won’t accept inconvenient times for commuter travel. How is it “commuter” travel if the train leaves at 10am and only stays in the city for 30 minutes?? It will operate only 4-days per week at a $2.5 million loss per day. Yes, you read that correctly. It will operate at a loss of $2,500,000 per day. NO thanks! We don’t need anymore of those “good ideas”. They also estimate 26,000 people will ride it per day. Yeah, right. Come to the meeting!!! Contact Larry Johnson from City of Valdese 879-2120 for meeting date and time. Judith Ray is the Chairwoman of WNC Rail Committee, 828-669-3720. She has more detailed information about the project. 3/17 – Young Republicans meeting at the Library, 7pm. 3/19 Caldwell County GOP County Convention 8:30am – 11am. This will cost $1. You must be a county delegate attend and vote. This is a very important convention where your vote will effect the direction of the Party for 2 years. There will be many offices up for election: Chairman, 2 Vice-Chairman, Secretary, Treasurer, and 20 (or so) At-Large Executive Committee members. There is a job for everyone. Tickets on sale for March 25th Lincoln-Reagan Day Dinner with Pat McCrory ($50 each). Tickets on sale for April 9th Afternoon Tea & Belk Fashion Show ($25 each). 3/19 Concealed Carry Class in Lenoir with Randy Martin. See their website.http://concealedcarrync.wordpress.com/ I highly recommend this class and this instructor! 3/24 MEETING – A special after-the-convention meeting, 7:30pm. Please come talk to everyone. Share your experiences. There is no real agenda, just a discussion group. This is a great time to ask questions and vent!! Special time — 7:30pm at the Library. 2/?? Local medicinal herb class. Learn to identify and prepare herbs for medicines. Evening class given at Western Piedmont Community College. January date to be announced. 2/2 – Caldwell TEA Party MEETING (Wednesday). Presentation and summary by Jason Raines about the best selling book “The Roots of Obama’s Rage” by Dinesh D’Souza. 2/6 – Gun Club get together. If you are interested, I will be at Springs Road Gun Club between 4-6pm. Come by and shoot with me. I wanna make this a social thing, as well as a way to become a better gun user. If you feel like it, come see the range and shoot a few rounds with me. If you’re not a member yet, you can pay ME for you membership there. See link for details. 2/8 – Caldwell County GOP Meeting, 7pm at the Caldwell County Library. 2/10 – Young Republicans meeting at the Library, 7pm. Elections for officers will be held tonight. 2/10-12 Conservative Political Action Committee (CPAC) Annual Convention in Washington, DC. Saturday (2/12) lectures and activities. $75 is the price of the tickets now. http://www.conservative.org/cpac/ I will be attending the Saturday (2/12) lectures and activities. Due to some medical issues that my dad is having and a surgery scheduled for Friday, I will not be attending CPAC this year. 2/16 or 17 or 23 or 24th – WNC Commuter Railroad meeting in Valdese at the Townhall at noon(? I will confirm time). This meeting was postponed for another month. POSTPONED UNTIL MARCH. See March calendar for project details and link. 2/17 – Caldwell TEA Party MEETING (Thursday). Neal Thomas presenting information about SB.897 (NC’s own version of United Nations Agenda 21 where zoning, sustainable “stuff”, new construction, recreation, green spaces, commuter railways, etc… are gov’t controlled). Also we will have a very, very important planning meeting. Everyone is urged to come to this meeting. At the last meeting (2/2), Jason Raines began his summary presentation of the bestselling book by Dinesh D’Souza “The Roots of Obama’s Rage”. He will conclude his summary tonight. 2/21 Republican precinct meetings 6pm (arrive early). Location: at your precinct poll location. See link for precincts. You must become a county delegate at this meeting in order to vote for County Chairman on 3/19. Your name must be on the list. Please consider holding office either at the precinct or county level. You must be a registered Republican and reside in Caldwell County to attend and vote. Precinct Chairman, Precinct Vice-Chair, and Precinct Secretary will be elected. Sign-ups for county delegates will take place as well. CANCELLED –> 1/11 – Caldwell County GOP meeting. 7pm at the Library in Lenoir. Be there! IF IT IS RE-SCHEDULED I WILL LET YOU ALL KNOW. 1/13 – Caldwell TEA Party MEETING (Thursday). Our first meeting of the new year! Thursday, 1/13, at the Caldwell County Library at 7pm. On the agenda: local Party politics, summary overview of what is meant by “preparation” for hard times. Road trip planned for Warren Daniel’s swearing in in Raleigh on Wed., 1/26. Randy Martin’s next Concealed Carry class 1/15 (see below). Spring’s Road Gun Club memberships still available for $35 per year. Who wants to meet during the day the library to learn about social media (facebook, twitter, blogging)?? You can register in one of three ways: 1) Complete the online registration form at the following link: http://www.formstack.com/forms/?1005010-k1rxwlVHVy, 2) Contact Joseph at (828) 302-8530 or by e-mail at concealedcarrync@gmail.com , or 3) By dropping in at the Ebay and Guns Too store in Lenoir located beside Ruby Tuesdays on Hwy 321. 1/18 Caldwell County GOP Meeting, (Tuesday) 7pm at the library. 1/19 WNC Commuter Railroad meeting in Valdese at the Townhall at noon. POSTPONED until mid to late Februray. There is a big, federal, project underway to build a new commuter railroad line from Salsbury, NC, to Asheville, NC, at an estimated cost for construction of $1 million per mile. There is a public hearing in Valdese. I urge you all to be there, especially if you think this is misuse of taxpayer money!! 1/20 Caldwell County Young Republicans (CCYR) meeting. 7pm at the Caldwell County Library. 1/22 Personal Preparedness seminar in Hendersonville 1:30 – 3:30pm (Saturday) at the downtown Library. Come hear Ryan Croft discuss all sorts of methods of personal / family preparation and survival for what he calls “the coming collapse.” This is Part 3 of a three part series. Even if you don’t believe there will be a collapse, you must concede that there will be come rough times ahead. No charge for the seminar, but they do take donations. 1/26 – Swearing-In for NC Senator Warren Daniel, NC Assemblyman Edgar Starnes, and the whole NC legislative body in Raleigh. I’m planning a road trip for a day trip. Contact me if you wanna go. 1/27 FIRE IN THE HEARTLAND presented by the Iredell County Women’s Club at the Iredell County Library in Statesville. An excellent documentary about the condition of America today as seen through the eyes of America’s women: Michele Bachmann, Michelle Malkin, Ann Coulter, Doneen Borelli, Dana Loesch, Phylis Shafley, Jenny Beth Martin, and many others. This is a very inspiring movie that I plan I show here in Caldwell County.